Founder Suzie Godfrey's goal is to combine gourmet products and flavours in order to create gifts everyone will want to receive, fresh and beautifully presented with each treat being paired with specially selected Teapig teas. Her passion for afternoon tea, delicious sweet treats and tea inspired her to build a business that brings indulgence to others through the post. 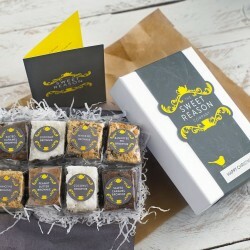 So gift your loved ones a sweet reason to sit back and relax with a warm cup of tea and a delicious treat. The Sweet Reason have been featured in several magazines such as 'Vogue' and 'Delicious.' Sainsburys online magazine placed them in their 'Best for... the chocoholic' category quoting them as "The ultimate in chocolaty naughtiness."